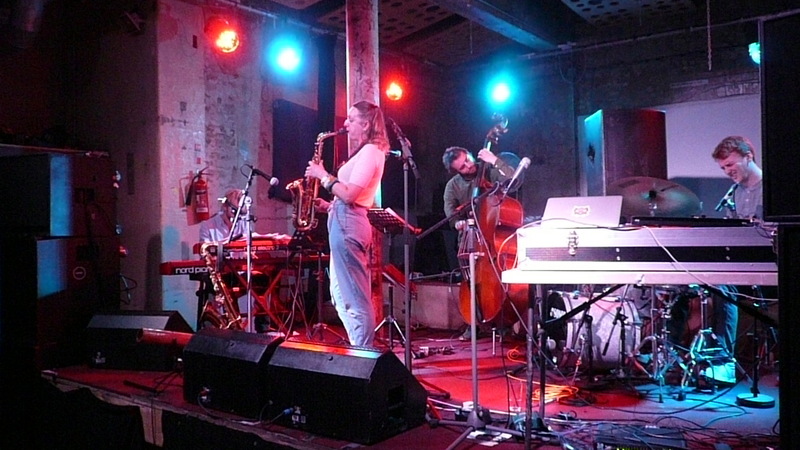 On the face of last night’s stunning set of performances the future of improvisational music is safe in the hands of the upcoming generation of instrumentalists and composers who appeared as part of the Whirlwind Recordings Mini-Festival at Stereo in Glasgow. Label founder and internationally renowned bass player, Michael Janisch, during a brief conversation prior to the gig, says he wanted to present music on his own terms and creating an independent record label was the only way to further those aims. The label is now in it’s sixth year and has an impressive array of talent among it’s roster of artists. The evening opened with a rousing set of self penned and yet to be recorded compositions from Glasgow-based sax player Konrad Wiszniewski backed by the Paradigm Shift rhythm section of Michael Janisch on upright bass, Frenchman Cedric Hanriot on keys and New York resident Colin Stranahan on drums. Playing mainly tenor sax throughout, with a couple of excursions on soprano sax, Konrad Wisniewski played with a full sound and great intonation. He opened up on the first number in exuberant style which set the tone for the rest of the set with some great sympathetic accompaniment from the talented trio. Highland Mary was notable for some subtle brush playing from Stranahan and Destination Unknown with it’s opening theme stated on soprano sax featured a tremendous solo from Henriot. Next up was Shetland born but London-based Rachael Cohen on Alto Sax, again in a piano trio setting with Tom Gibb on keyboards, Dave Houghd on drums and Mark Lewanoswski on bass. A slightly more laid back and clear sound belied a forceful set of mainly self penned numbers with Lewanoswski outstanding on a couple of bass solo excursions. Cohen’s angular bluesy solo on Ornette Coleman’s Just For You was a particular high point in a constantly engaging performance. Paradigm Shift finished off the night with a tour de force display of instrumental firepower that ranks alongside any jazz gig I’ve been to in the past and I’m including some very big names in that list. The driving rhythm section of Janisch (on electric bass too), Stranahan and Henriot was fronted by Paul Booth on tenor sax and Didgeridoo(! 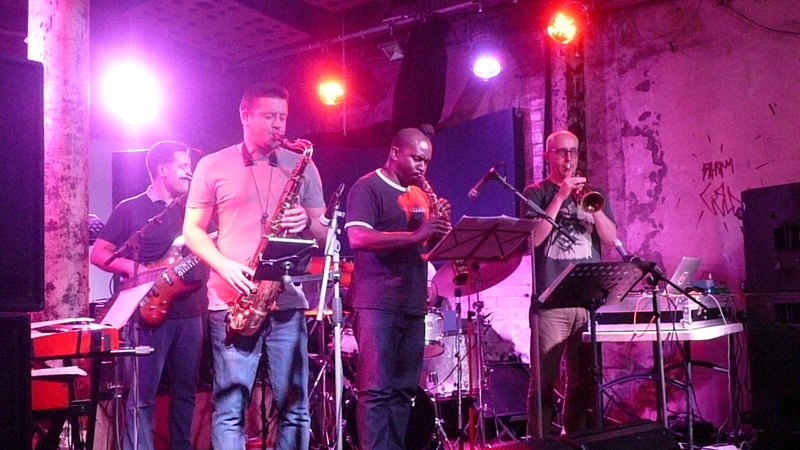 ), Jason Yarde on soprano sax and Alex Bonney on trumpet and electronics. Bonney was using live feeds of the band and processing them back through the PA mix which gave some very interesting extra textures to the overall sound. When all three front men were blowing at the same time there was a bizarre mixture of demented hot jazz from the 1920’s and Eric Dolphy in outer space somewhere. Jason Yarde’s soprano sax solo on Crash had the audience gasping in disbelief at his sheer virtuosity and the quirky Mike’s Mosey had a great echo bass solo. Likewise,Awakening, a Paul Booth composition, had a stunning keyboard solo from Henriot that had the audience shouting their appreciation. Mention has to be made of the crystal clear quality of the sound throughout and the sheer enthusiasm of all the performers who were obviously having a great time. No po-faced old jazzers here. Looking forward to day two. A distinct feeling of deja vu as I trudged down the remarkably uneven cobbles of Renfrew Lane for day two of the Whirlwind Recordings Mini-Festival at Stereo in Glasgow. That feeling evaporated as soon as the first band of the evening Ryan Quigley Quintet took to the stage. After an opening bass theme played by Michael Jarmisch (who would go on to play bass all night- his fingers must be sore today) the rest of the band featuring Ryan Quigley on trumpet, Alyn Cosker on drums,Alan Menzie on keyboards and Paul Booth on tenor sax basically exploded into action for nearly a solid hour of music. There were perhaps about six distinct pieces which were played without a break or introductions and Ryan Quigley showed a talent for cliché-free soloing that was totally refreshing in it’s delivery. He has a beautiful clean tone.The music in it’s approach was reminiscent of the Plugged Nickel era Miles Davis Quintet in many ways. The other soloists played a major part too with some absolutely thunderous drum excursions from Alyn Cosker a major highlight and Paul Booth along with Alan Menzie had some great moments too. The second act of the night, Tom Gibbs Quartet was a complete contrast to the pyrotechnics of Ryan Quigley and was a far more reflective and melodic set. Featuring composer and keyboard player Gibbs, alto saxist Alan Jackson, Dave Houghd on drums and the aforementioned Michael Jarmisch on bass the band played a number of Tom Gibbs’ own compositions. Outstanding for me were Heartbreaker and A little Something both featuring Fender Rhodes tinged piano solos from Tom Gibbs and well constructed sax playing from Jackson. A subtle and captivating performance. Finally Paradigm shift returned to the stage for the second night and showed yet again what an accomplished act they are with Jason Yarde’s soprano sax solo on Crash again absolutely astonishing in it’s virtuosity. They have a new double CD out shortly which should be well worth a listen. Another five star night of absorbing music and outstanding musicianship.